Detroit’s name comes from the Detroit River, which is derived from the French name meaning the strait of Lake Erie. The land was settled by Antoine de la Mothe Cadillac along with 51 additional French-Canadians and was named Fort Ponchartrain du Detroit. France offered free land to attract families to Detroit and it became the largest city between Montreal and New Orleans. Detroit’s French heritage can still be seen today on the state flag. British troops gained control of the territory during the French and Indian War and the name was shorted to Detroit. The city was besieged during the war and the British Royal Proclamation of 1763 was passed restricting white settlement in Indian territories. The Jay Treaty of 1796 gave Detroit to the United States just before the settlement burned almost completely down in 1805. From 1805 to 1847, Detroit was the capital of Michigan. It was captured during the War of 1812 in the Siege of Detroit and was recaptured in 1813. The city’s access to the Canadian border made it a critical stop along the Detroit Underground Railroad. During the Civil war, many Detroiters volunteered to fight for the Union Army. General Custer led the Michigan brigade during the American Civil war and called them the Wolverines. During the early 1900s Detroit was referred to as the Paris of the West for its beautiful gilded age architecture, and Washington Boulevard, which was electrified by Thomas Edison. Detroit emerged as a transportation hub and a growing manufacturing city which prompted Henry ford to build his first automobile in a rented workshop on Mack Avenue. Ford Motor Company was soon to follow in 1904. Other auto manufacturers such as William C. Durant, the Dodge brother, Packard, and Walter Chrysler further reinforced Detroit as the world’s automotive capital and giving it the nickname the Motor City. The 1930s and 1940s brought more attention to Detroit due to bitter disputes between the United Auto Workers and the auto manufacturers. These rivalries brought attention to union leaders such as Jimmy Hoffa and Walter Reuther. Industrial growth during World War II made the city known as the Arsenal of Democracy. Mass European immigration during the 1940s led to social tensions and rapid growth along with the color blind promotion policies of the auto plants eventually led to a full scale riot in 1943. Consolidation during the 1950s especially in the auto industry increased competition for jobs, and by the late 1960s much of the population shifted to the suburbs. The city tax base eroded and the population dropped further. Gasoline crises of 1973 and 1979 hurt the auto industry and drugs became a large problem within the city. 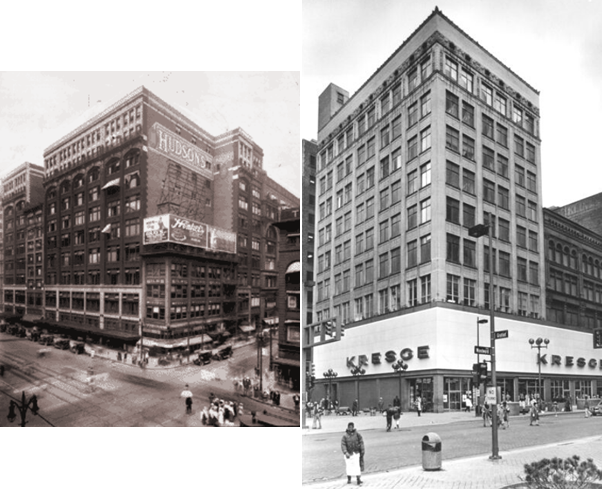 City leaders attempted to construct a Renaissance of the city, but businesses continued to leave Detroit until the 1990s. The 1990s brought new businesses such as Comerica Tower, the MGM Grand Detroit, MotorCity Casino, and Greektown Casino. New stadiums were constructed for the Detroit Lions and the Detroit Tigers and the historic Book Cadillac Hotel and the Fort Shelby Hotel reopened for the first time in over 20 years. Events such as Super Bowl XL, the 2006 World Series and the NCAA Final Four offered further improvements to the downtown area. Riverfront development is now the focus of city planners. Following the example of Windsor, Ontario, condos are being erected as well as miles of parks and fountains. The new additions are some of the most expensive housing that the city has ever seen.